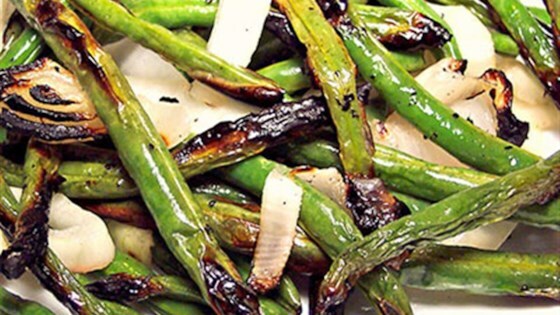 "Fresh green beans and onions take on a whole new flavor profile when grilled with a little Diamond Crystal® Kosher Salt. The green beans become smoky and the onions become sweet. The perfect side dish to any meat or fish main dish." Toss the green beans and onions in a bowl with the olive oil and Diamond Crystal(R) Kosher Salt. Place mixture into a steamer basket or shallow grill pan. Place on the grill and close the lid. Cook until beans and onions, stirring every 5 minutes, until veggies have a slight char, 10 to 15 minutes. An outdoor version of the slow-cooker classic! Prepared as directed. The char on the beans and onions was delicious! Going to be a staple on my grill.